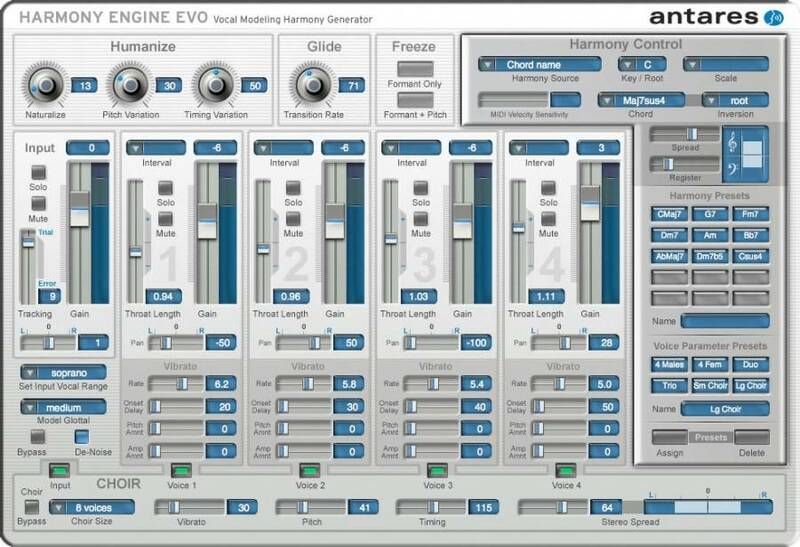 Whether you're an experienced vocal arranger, a songwriter looking for that perfect backup vocal, or a composer experimenting with unique vocal effects, Harmony Engine Evo gives you entirely new ways to create the harmony parts you hear in your head. Harmony Engine Evo incorporates Antares' groundbreaking Evo Voice Processing Technology for faster, more accurate pitch detection, smoother, artifact-free pitch shifting, and seamless, natural-sounding (if you want it to be) throat modeling. And with 5 channels of Antares' unique CHOIR Vocal Multiplier, you can create huge vocal ensembles out of a single vocal line. With four independent harmony voices, a variety of powerful harmony generating modes, humanization features for natural sounding performances, and a flexible real-time preset system for harmony and vocal type, Harmony Engine Evo provides incredibly easy-to-use tools to quickly and easily produce virtually any vocal arrangement you can imagine. In fact, experimenting with different harmonies is so easy (and, dare we suggest, fun), you may find yourself using Harmony Engine Evo to explore harmonic alternatives you may have never otherwise considered. • Antares' groundbreaking Evo Voice Processing Technology for faster, more accurate pitch detection and smoother, artifact-free pitch shifting. • A Voice Parameter Preset matrix that lets you create and instantly recall up to 6 different "vocal groups"
Harmony Engine Evo. The quickest, easiest tool for harmony creation. From the worldwide leader in professional vocal processing technology. Mac OS 10.11 is not supported at this time. • Pro Tools 7.x to 10.x (except Pro Tools SE and M‑Powered Essential, which do not accept 3rd party plug-ins). • Mac OS 10.5.8 to 10.9.5 as required by your version of Pro Tools. • A certified compatible VST host program that supports the VST3 format. • Mac OS 10.5.8 to 10.10.5 as required by your host. • A certified compatible host program that supports the Audio Units format. The VST and AU versions can operate in both 64-bit and 32-bit modes. Windows 10 is not supported at this time. • Pro Tools 7.x - 10.x (except Pro Tools SE and M‑Powered Essential, which do not accept 3rd party plugins). • A certified compatible host program that supports the VST2 or VST3 format. 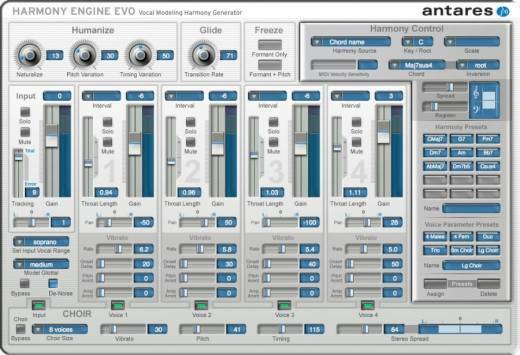 Harmony Engine Evo's MIDI functions require that your host allow routing of MIDI to plug-ins. If your host application does not support the routing of MIDI to plug-ins, Harmony Engine Evo's MIDI functions will not operate (and trust us, you will be seriously bummed). *Harmony Engine Evo authorization requires an iLok USB smart key and the ability to access ilok.com (on any computer).